INTI students once again succeeded in being ranked among the top students in the world. 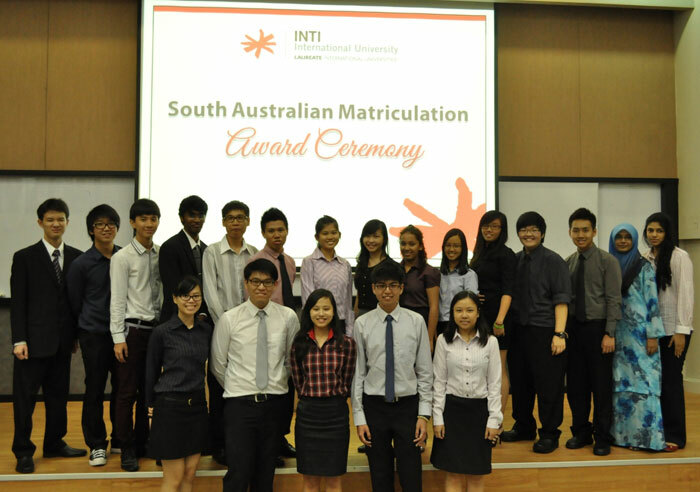 Of the 71 students from INTI International University who sat for the South Australian Certificate of Education (SACE) examinations in November last year, 20% ranked top 5% in the world with an Australian Tertiary Admission Rank (ATAR) of 95 and above. 31% ranked top 10% (ATAR of 90 and above) while 55% ranked top 20% (ATAR of 80 and above). Lew Yun Xin scored the highest ATAR of 99.55 (top 0.45%) in the world. She obtained all As in the subjects she took (A+ for Accounting and English as Second Language Studies and As for Economics, Mathematical Studies and Specialist Mathematics). In addition, she was awarded two Subject Merit Certificates for ESL Studies and Accounting and won the SAM Subject Highest Achiever Award for Accounting. Kenny Liew, Lew Yun Xin and Chiew Chong Keat (front row: 2nd, 3rd and 4th from left respectively) with other SAM high achievers at INTI International University. Chiew Chong Keat was the second highest achiever with an ATAR of 99.50 placing him in the top 0.5% in the world. His achievements were A+ for Mathematical Studies, Physics and Specialist Mathematics, and A-s for Chemistry and ESL Studies. He also received the Subject Merit Certificate for Physics. Kenny obtained A+s for Accounting and ESL Studies and As for Economics, Legal Studies and Mathematical Studies. Apart from this, he was awarded the Subject Merit Certificate for ESL Studies and won the most outstanding advocates’ award in the prestigious Bond University Moot Competition in 2012. “I would like to extend the sincere congratulations from Dr. Paul Kilvert, Chief Executive of SACE Board. He also commends the extraordinary achievements of these students. These achievements wouldn’t have been possible without the dedication and support of SAM lecturers and the students’ parents,” said Jan Raymond, SACE Executive Manager, who was present at a special award ceremony at INTI International University organised to recognise the students’ achievement. The internationally recognised South Australian Matriculation (SAM) qualification is equivalent to Year 12 of education in Australia. It allows students to gain direct entry into universities in Australia, New Zealand, the UK, USA and other countries. INTI International University – the largest centre for SAM in the southern region of Malaysia – is one of the few SAM examination centres in the country that are recognised by the SACE Board of South Australia, which awards the South Australian Certificate of Education and administers the SAM programme.